Built 1925-1928 by Edmund Fryk as "Lietuvos Teisingumo" (Palace of Justice). 1936-1940 used as Lithuanian Parliament ("Seimo rumai"). 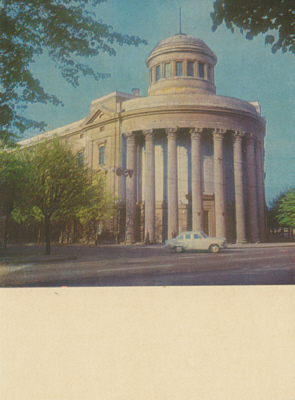 1961 partly converted to a concert hall and renamed "Valstybine Filharmonija" (State Philharmonic Hall). 2005-2008 major restoration. Reverse Text: "Kaunas, Filharmonijos rumai. Zdanie filarmonii. The Philharmonic. Philharmonie"